Rigoberta Menchú Tum (Spanish: ; born 9 January 1959) is an indigenous woman from the country of Guatemala, of the K'iche' ethnic group. Menchú has dedicated her life to publicizing the rights of Guatemala's indigenous peoples during and after the Guatemalan Civil War (1960–1996), and to promoting indigenous rights in the country. She received the Nobel Peace Prize in 1992 and the Prince of Asturias Award in 1998. She is the subject of the testimonial biography I, Rigoberta Menchú (1983) and the author of the autobiographical work, Crossing Borders. Menchú is a UNESCO Goodwill Ambassador. She has also become a figure in indigenous political parties and ran for President of Guatemala in 2007 and 2011. Rigoberta Menchú was born to a poor indigenous family of K'iche' descent near Laj Chimel, a small town in the north-central Guatemalan province of El Quiché. Menchú received a primary-school education as a student at several Catholic boarding schools. After leaving school, Menchú worked as an activist campaigning against human rights violations committed by the Guatemalan armed forces during the country's civil war, which lasted from 1960 to 1996. Her father, Vicente Menchú, was a member of the guerrilla movement Guerrilla Army of the Poor and died in 1980 during the Burning of the Spanish Embassy after being captured and tortured for his role in organizing against abusive landowners. 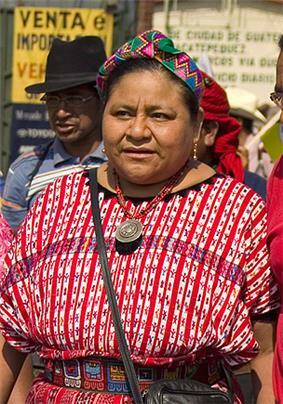 In 1981, Rigoberta Menchú was exiled and escaped to Mexico. In 1982, she narrated a book about her life to Venezuelan author and anthropologist Elizabeth Burgos, "Me llamo Rigoberta Menchú y así me nació la conciencia" (My Name is Rigoberta Menchu and this is how my Conscience was Born), which was translated into five other languages including English and French. The book made her an international icon at the time of the ongoing conflict in Guatemala. Since the Guatemalan Civil War ended, Menchú has campaigned to have members of the Guatemalan political and military establishment tried in Spanish courts. In 1999 she filed a complaint before a court in Spain because prosecutions of crimes committed during the civil war are practically impossible in Guatemala. These attempts stalled as the Spanish courts determined that the plaintiffs had not yet exhausted all possibility of seeking justice through the legal system of Guatemala. On 23 December 2006, Spain called for the extradition from Guatemala of seven former members of Guatemala's government on charges of genocide and torture. These include former military rulers Efraín Ríos Montt and Óscar Mejía. Spain's highest court ruled that cases of genocide committed abroad could be judged in Spain, even if no Spanish citizens have been involved. In addition to the deaths of Spanish citizens, the most serious charges include genocide against the Mayan people of Guatemala. In January 2015, a Guatemalan court convicted the commander of a former police investigations unit of murder, attempted murder and crimes against humanity for his role in the embassy attack, in which Menchú's father died. Menchú has become involved in the Indian pharmaceutical industry as president of the company Salud para Todos ("Health for All") and the company "Farmacias Similares", with the goal of offering low-cost generic medicines. She served as presidential goodwill ambassador for the 1996 peace accords. That same year she received the Peace Abbey Courage of Conscience Award in Boston. In 2006, Menchú was one of the founders of the Nobel Women's Initiative along with sister Nobel Peace Laureates Jody Williams, Shirin Ebadi, Wangari Maathai, Betty Williams and Mairead Corrigan Maguire. Six women representing North America and South America, Europe, the Middle East and Africa decided to bring together their experiences in a united effort for peace with justice and equality. It is the goal of the Nobel Women's Initiative to help strengthen work being done in support of women's rights around the world. She is a member of  She travels around the world speaking to youth through PeaceJam conferences. Rigoberta Menchú is also a member of the Fondation Chirac's honour committee, ever since the foundation was launched in 2008 by former French president Jacques Chirac in order to promote world peace. On 12 February 2007, Menchú announced that she would form an indigenous political party called Encuentro por Guatemala and that she would stand in the 2007 presidential election. Had she been elected, she would have become Latin America's fourth indigenous president after Mexico's Benito Juárez, Peru's Alejandro Toledo and Bolivia's Evo Morales. In the election, Menchú was defeated in the first round, receiving three percent of the vote. After the elections, Rigoberta Menchu gave a message of peace to all Guatemalans on television. In 2009 she was involved in the newly founded party Winaq. Menchú was a candidate for the 2011 presidential election, but lost in the first round. 1992 Nobel Peace Prize "in recognition of her work for social justice and ethno-cultural reconciliation based on respect for the rights of indigenous peoples." More than a decade after the publication of I, Rigoberta Menchú, anthropologist David Stoll carried out an investigation of Menchú's story, researching government documents, reports, and land claims (many filed by Menchú's own family), and interviewing former neighbors, locals, friends, enemies, and others for his 1999 book Rigoberta Menchú and the Story of All Poor Guatemalans. Stoll claimed that Menchú changed some elements of her life, family and village to meet the publicity needs of the guerrilla movement, which she joined as a political cadre after her parents were assassinated. The controversy caused by Stoll's book received widespread coverage in the US press of the time. Historian Greg Grandin writes that Stoll's research on the Guatemalan revolution is mostly wrong, but states that "two of Stoll's charges concerning Menchú's life do have merit." First, he documents that she received some education, contradicting a claim that her father refused to send her to school because he did not want her to lose her cultural identity. Second, Stoll presents evidence that Menchú falsely placed herself at the scene of her 16-year-old brother's murder. According to Grandin, Stoll in a later interview agreed to the "essential factuality of Menchú's account of how her brother and mother died". In her critique on Stoll's work, The Silencing of Maya Women from Mama Maquin to Rigoberta Menchu, anthropologist Victoria Sanford highlights inaccuracies in Stoll's book, and claims that he used highly questionable sources as research informants. David Horowitz used Stoll's book to launch a campaign to discredit Menchú as a "Marxist terrorist," and "one of the greatest hoaxes of the 20th century," and to call for the revocation of her Nobel Prize. The Nobel Committee has dismissed calls to revoke her Nobel Prize because of the falsifications reported by Stoll. Geir Lundestad, the secretary of the Committee, said her prize "was not based exclusively or primarily on the autobiography". According to the Nobel Committee, "Stoll approves of her Nobel prize and has no question about the picture of army atrocities which she presents. He says that her purpose in telling her story the way she did 'enabled her to focus international condemnation on an institution that deserved it, the Guatemalan army.'" Beverley, John. "The Real Thing (Our Rigoberta)" Modern Language Quarterly 57:2 (June 1986): 129–235. ^ Irwin Abrams, The Nobel Peace Prize and the Laureates: An Illustrated Biographical History, Watson Publishing International, 2001, 296. ^ BusinessWire.com, 20 April 2015. Retrieved 16 Sept. 2015. 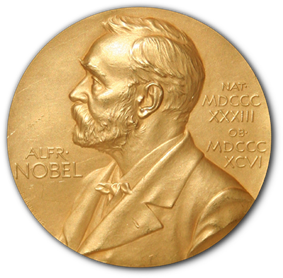 ^ "The Nobel Peace Prize 1992," Nobelprize.org. Retrieved 24 Sept. 2015. ^ "Premio Príncipe de Asturias de Cooperación Internacional 1998," Fundación Princesa de Asturias. Retrieved 24 Sept. 2015. ^ a b c Grandin, Greg. "It Was Heaven That They Burned", The Nation, 8 September 2010, p.3. ^ Grandin, Greg. "It Was Heaven That They Burned", The Nation, 8 September 2010. ^ Sanford, Victoria PhD. "The Silencing of Maya Women From Mama Maquin to Rigoberta Menchu", pp. 135-143; see p.142 for critique on Stoll's informant, Alfonso Riviera.